E～MIZU H2 is a sophisticated water server that produces highly-concentrated hydrogen water from tap water. It filters, purifies and generates high density neutral pH hydrogen water. 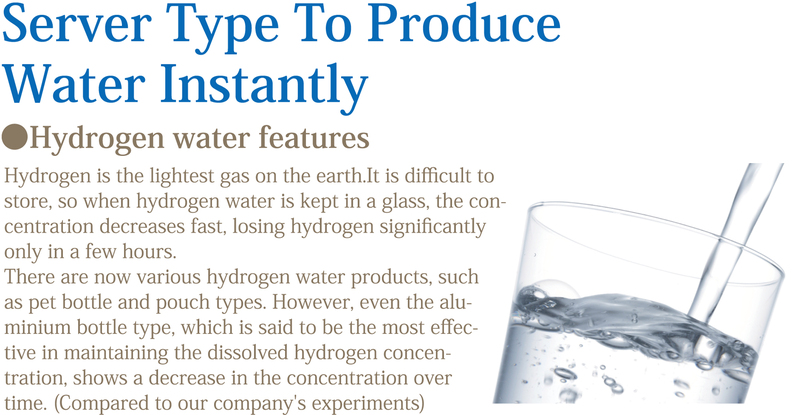 Enjoy fresh tasting hydrogen water with no chlorine smell. Product catalog with old names will be provided as ever. We aim to promote E～Mizu H2 and E～Mizu H2 Mini which are provided by us only in Hydrogen water server market, instead of Marugoto Nomu H2 in order to focus on the sales of E～Mizu series which have gallon bottled water supply system. Marugoto Nomu H2 will be supplied in a year as grace period and replaced with E～Mizu H2 series gradually. We proceed with the change on the concept "Produce good products with the name easy to remember for all people and with improvement not only appearance but inside of the machine"
Hydrogen to the body. A high density hydrogen water server was born. The pH increases when the density and the oxidation reduction potential of dissolved hydrogen are increased by using the alkaline ionized water apparatus and the water unsuited for drinking is generated. Because this hydrogen water server improves the density of dissolved hydrogen, the hydrogen water of the cheek neutral can be made. Anytime & Convenient"Enrich your Life with hydrogen water"
There has been much talk about the health and beauty benefits of hydrogen water. 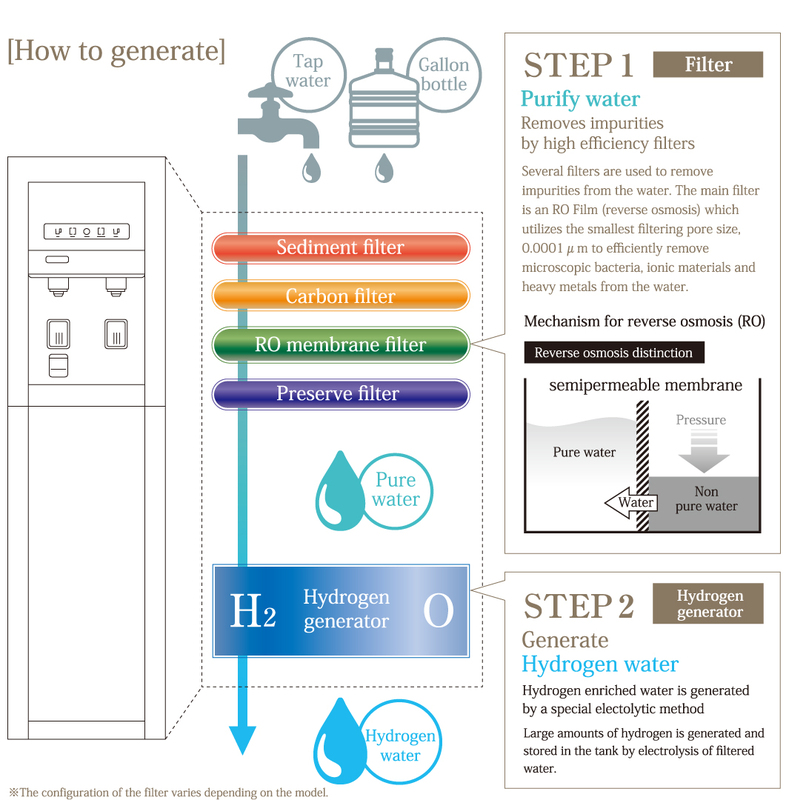 Now, hydrogen water is conveniently available. TECH CORPORATION hydrogen water servers can either use tap water or re-fillable gallon bottles as a source of water and they can be set up anywhere. ※1：7 is neutral and higher number is alkaline. ※2 ：The lower the number the stronger the reduction. ●The value may vary depending on the quality of the raw water.